this is a traditional slow-cooked recipe of making delicious carrot halwa with just carrots, milk, ghee, sugar and some dry fruits. 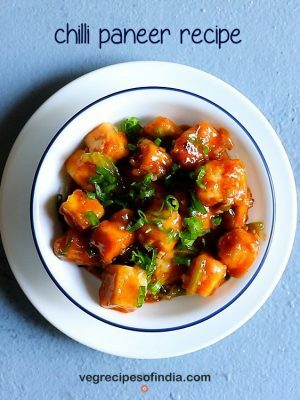 carrot halwa recipe with step by step photos and video. 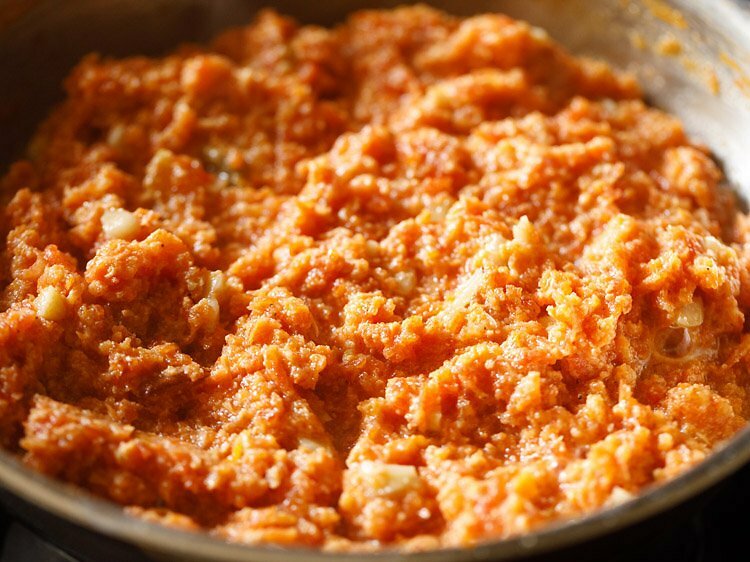 this carrot halwa recipe shares the traditional way of making delicious gajar ka halwa without any shortcuts or tweaks. by the way, at home in punjabi language we call carrot halwa as gajrela. 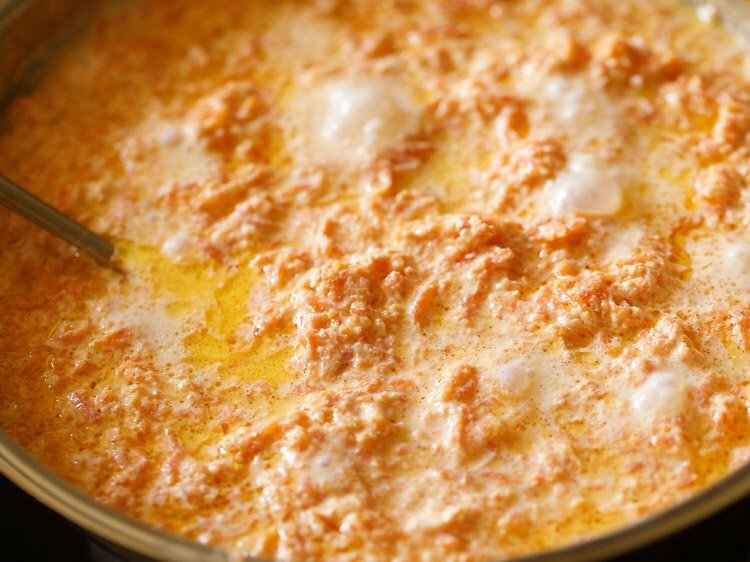 during winters, we make gajar halwa often. 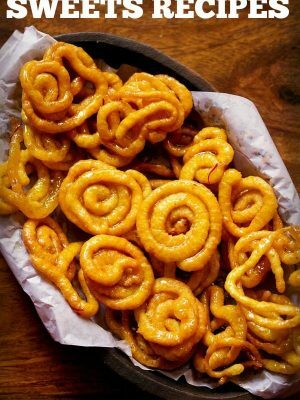 it is a popular sweet made in north india during winters. 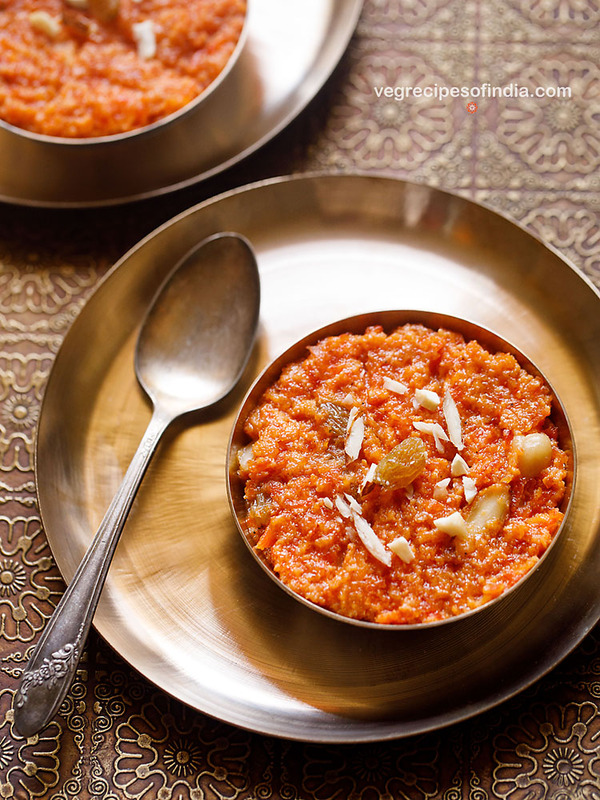 this traditional carrot halwa recipe uses just full-fat milk, ghee and sugar to make the halwa. 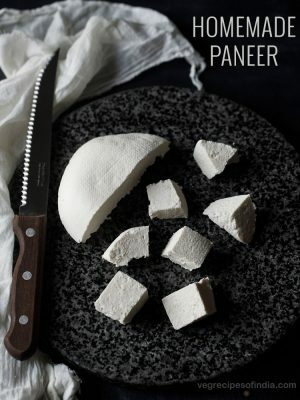 you don’t need khoya (evaporated milk solids) or condensed milk. 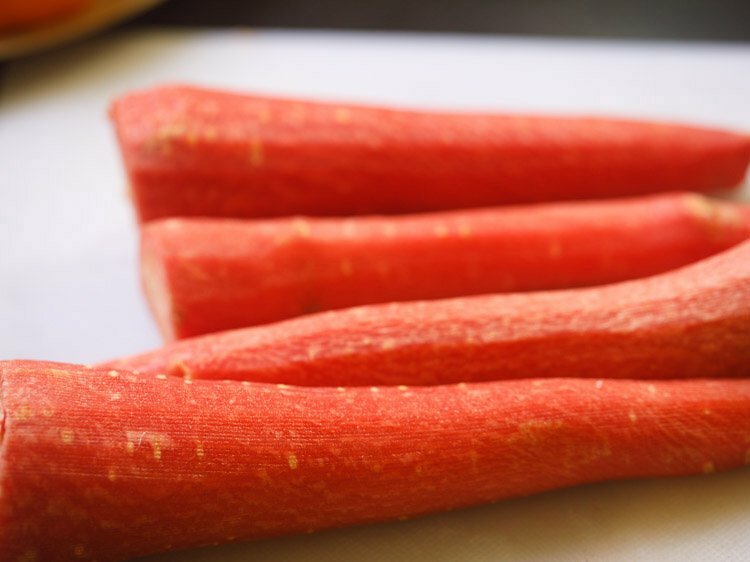 we generally use red delhi carrots to make the halwa as they are tender and juicy. on occasions, i have also made carrot halwa with orange carrots. you can use any carrots – red, orange or black. but just make sure they are not fibrous and dense. 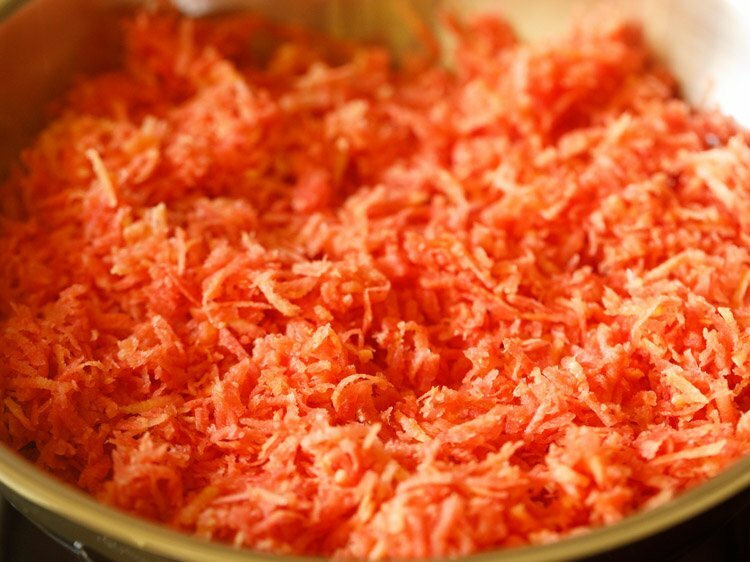 to make gajar halwa, it is important to buy tender and juicy carrots so that they are easy to grate. 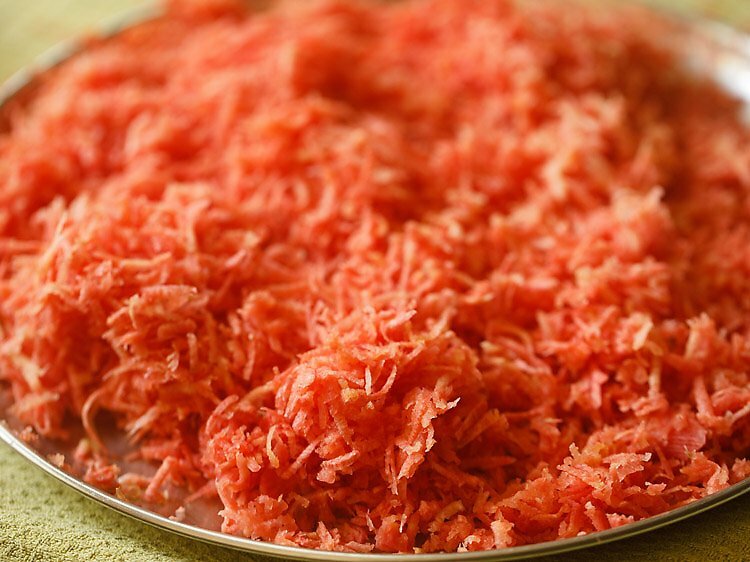 some arm work is needed to make this halwa as you have to first grate the carrots and then slow cook them in stove top and keep on stirring them on regular intervals. you can grate the carrots manually or in a food processor. obviously, the food processor makes grating the carrots easier. i suggest using a heavy iron kadai to make the halwa. 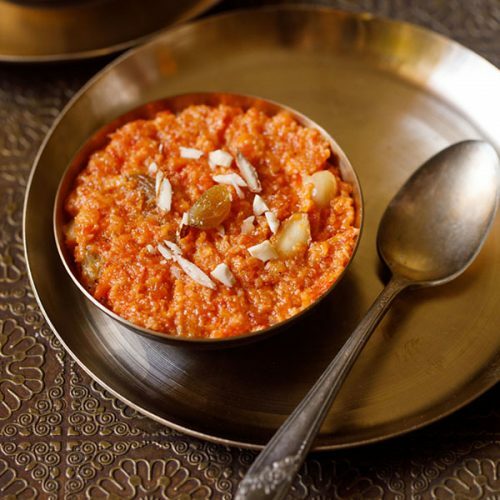 the carrot halwa is simmered and simmered and stirred often. so that it should not get burnt, a really good kadai makes the job easier. 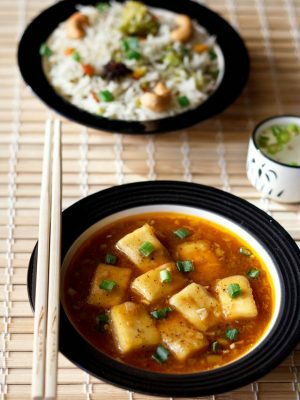 you can also use a non-stick kadai or a thick bottomed pan. 1. you can store gajar halwa in the fridge. it stays well for almost a week but will get over quickly. when serving, you can just warm the halwa and then serve. 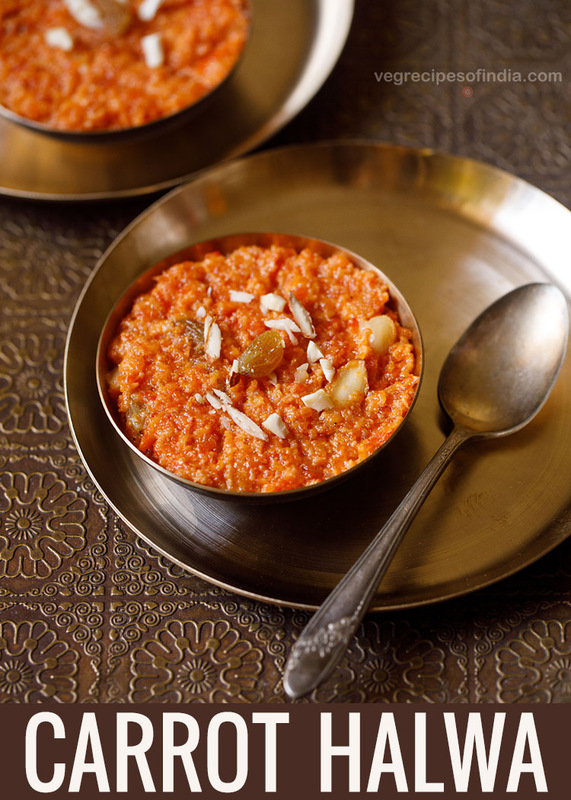 2. in the cold winters of north india, carrot halwa is served hot or warm. 3. you can even have the gajar halwa chilled if you prefer. some people like to have it cold or at room temperature and some people like to have carrot halwa hot or warm. it is just a personal preference. in some restaurants, they serve a combination of carrot halwa with vanilla ice cream and believe me this combo tastes good. first rinse, peel and then grate the carrots (8-9 medium sized tender juicy carrots), either with a hand held grater or in a food processor. you need approx 4 to 4.5 cups grated carrots. 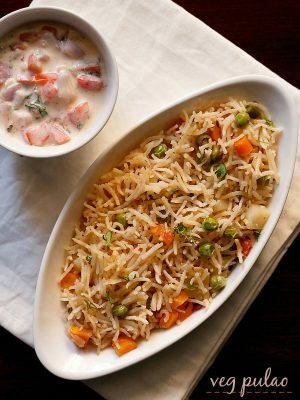 in a kadai or deep thick bottomed pan combine milk and grated carrots. on a low to medium flame, bring the whole mixture to a boil and then simmer. while the mixture is simmering on a low flame, keep on stirring in between. 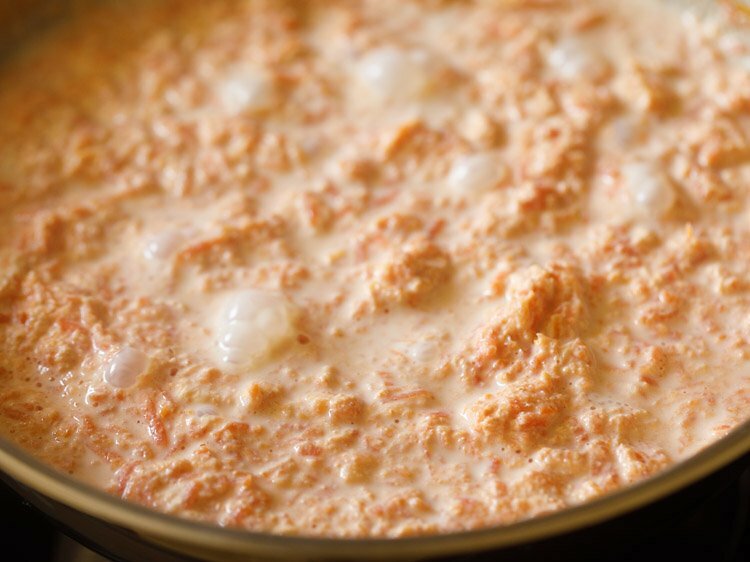 the grated carrots will cook in the milk and the milk will start to reduce and evaporate. 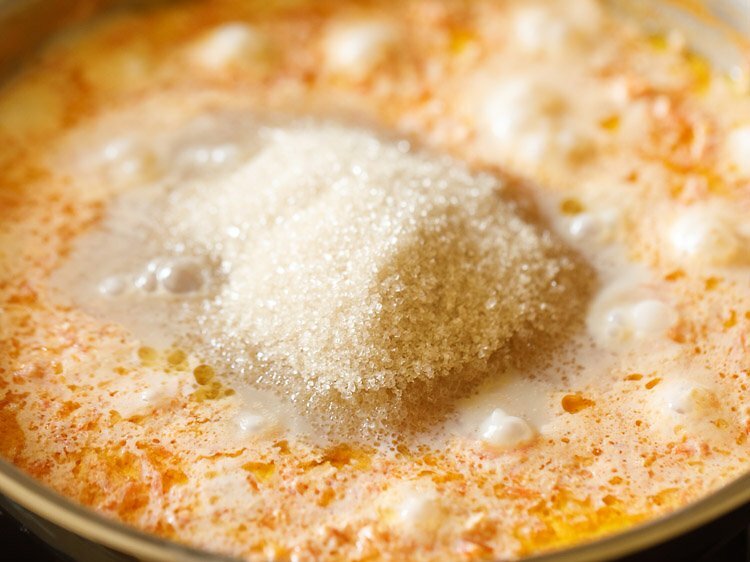 when the milk has 75% reduced, add the ghee, sugar and powdered cardamom to the mixture. stir well and continue to simmer and cook on a low flame. do keep on stirring the gajar halwa in between. 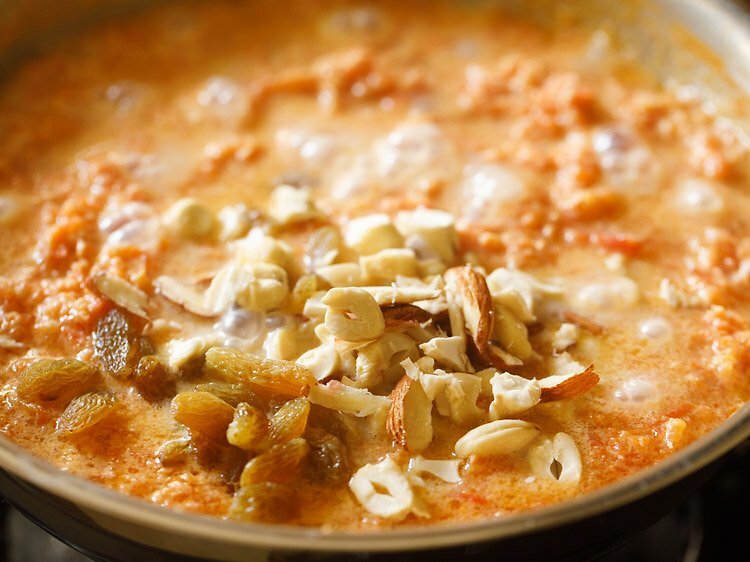 towards the end, add the cashews, almonds, saffron and raisins. 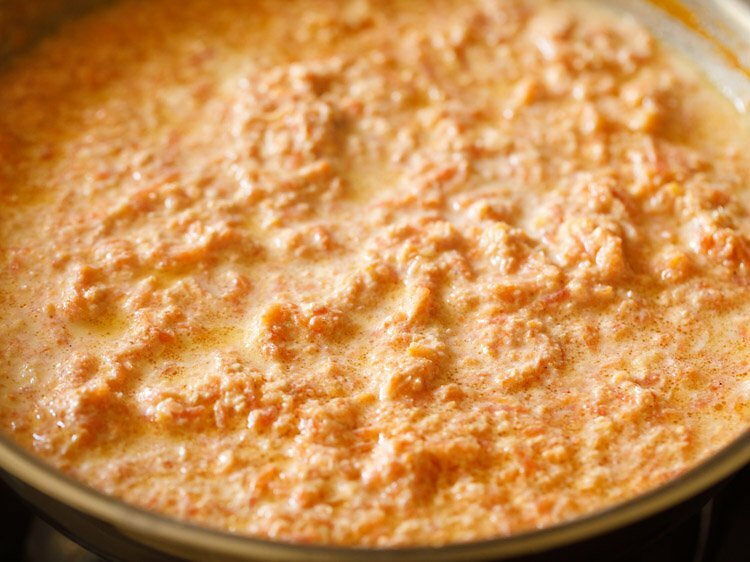 simmer carrot halwa till all the milk is evaporated. switch off the burner. 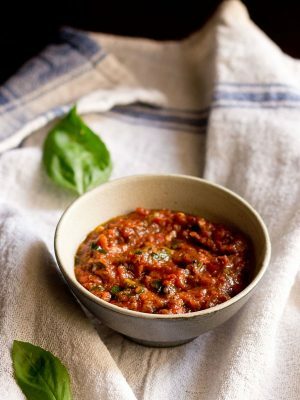 serve gajar halwa hot, warm or you can also serve it cold. garnish with some chopped dry fruits while serving. use fresh, juicy and tender carrots. carrot halwa stays good in the fridge for almost about a week. use full-fat milk or whole milk. add nuts and dry fruits of your choice. 1. first rinse, peel 650 grams carrots (8 to 9 medium-sized tender juicy carrots or 6 to 7 long carrots). 2. then grate the carrots either with a hand-held grater or in a food processor. you will need about 4 to 4.5 cups grated carrots. 3. in a heavy kadai, add all of the grated carrots. 4. pour 4 cups full-fat milk. switch on the burner. 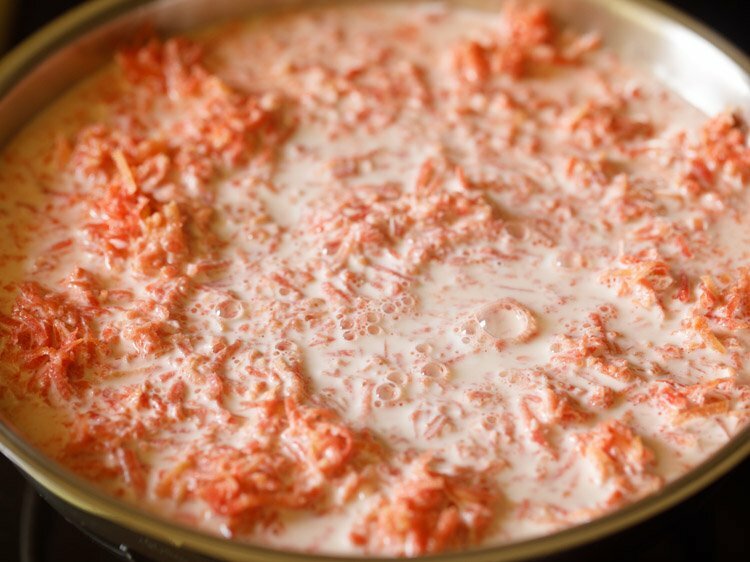 5. mix the grated carrots and milk together. 6. cook this mixture on a low to medium flame. 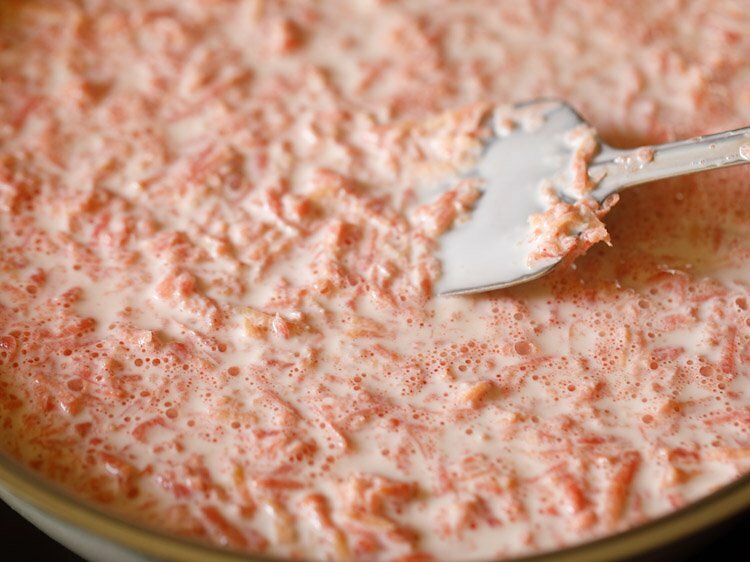 after some minutes, the milk will begin to froth first and then start reducing slowly and slowly. 7. keep on stirring this halwa mixture often. 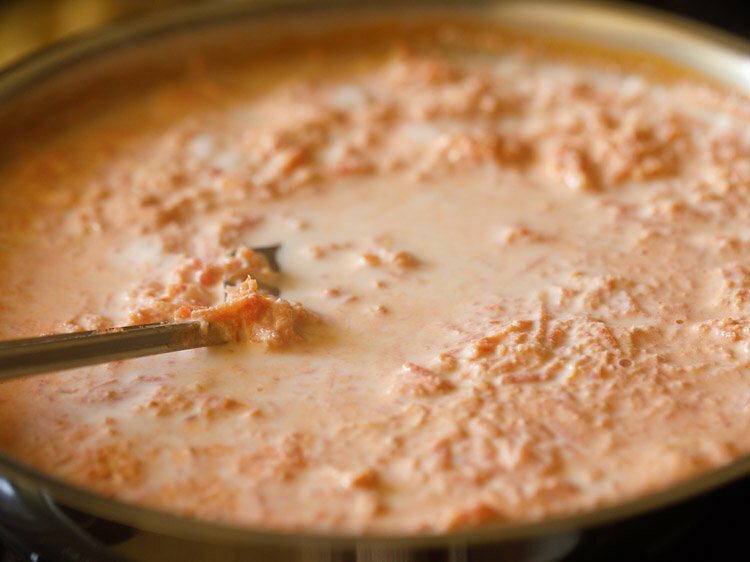 keep scraping the sides of the kadai to remove the evaporated milk solids. add the milk solids to the cooking mixture. 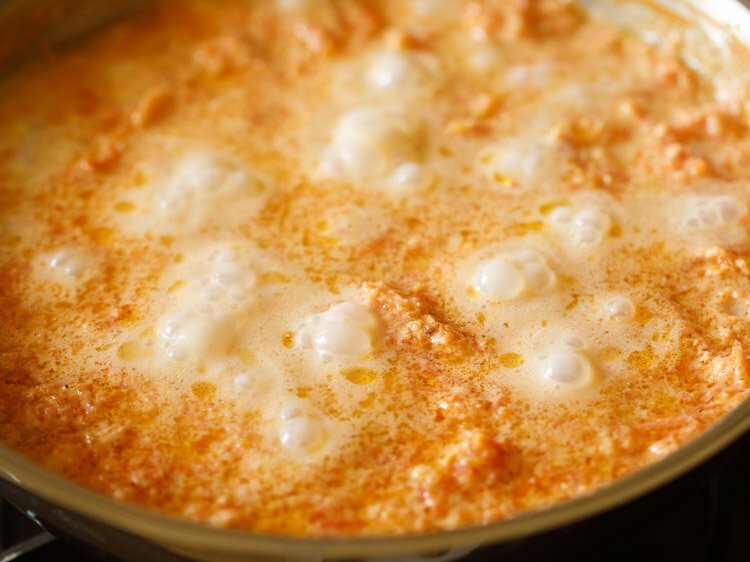 simmer carrots in milk and stir also at intervals, so that the milk does not stick to the bottom of the pan. 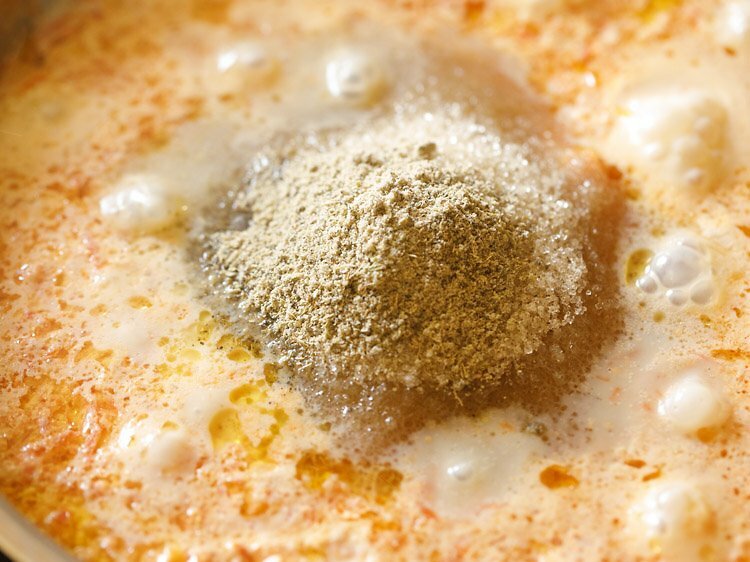 8. cook the carrot+milk mixture till milk is reduced by 75%. 9. then add 4 tablespoons ghee (clarified butter). 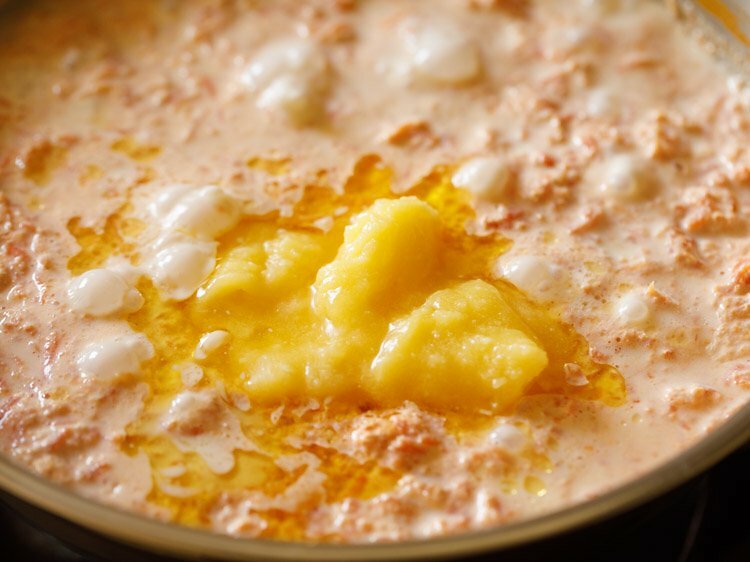 do note that some milk will be there when you add the ghee. 11. next add 10 to 12 tablespoons sugar or as required. 12. add cardamom powder – 5 to 6 green cardamom or choti elachi, powdered finely in a mortar-pestle or about ⅓ to 1 teaspoon cardamom powder. 14. continue to simmer on a low flame. do stir often. 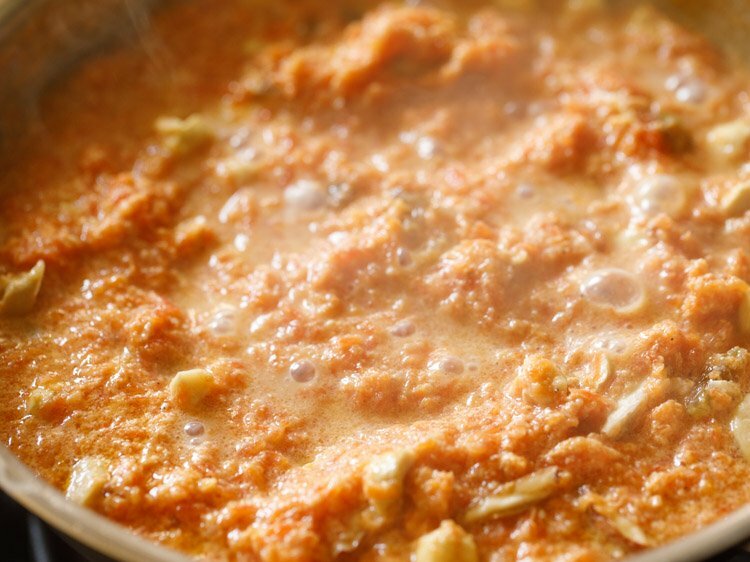 15. simmer till the carrot halwa mixture starts to thicken and reduces more. stir at intervals. 16. when the carrot halwa has reduced much and you see a little milk – like that of a pudding consistency. then add nuts and dry fruits. 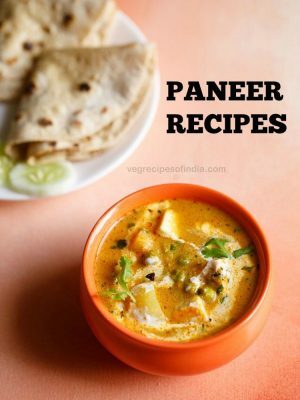 you can add your choice of nuts and dry fruits. i have added 12 cashews, 12 almonds and 2 tablespoons golden raisins. chop the nuts before you add. raisins can be kept whole. if using saffron, then you can add at this step. 17. mix again and continue to stir and simmer. 18. simmer till the whole halwa mixture becomes dry. 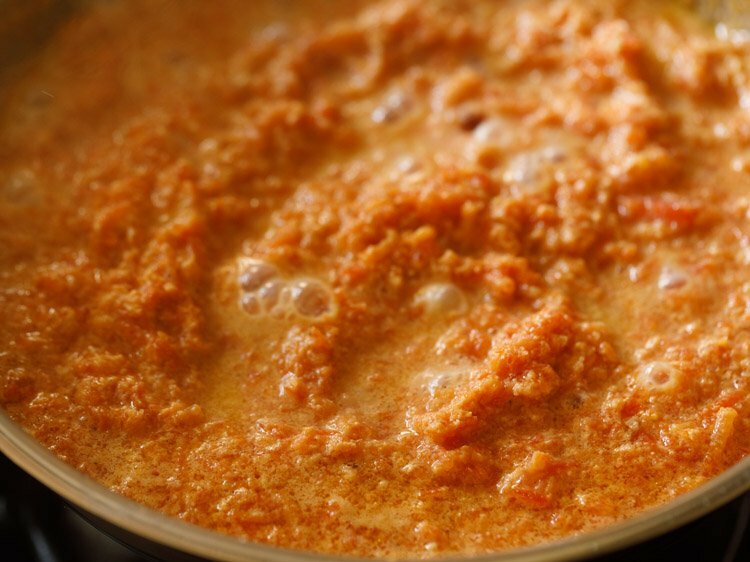 the milk should evaporate completely and you will see fine milk solids in the carrot halwa.you will also see some ghee being released from the sides. 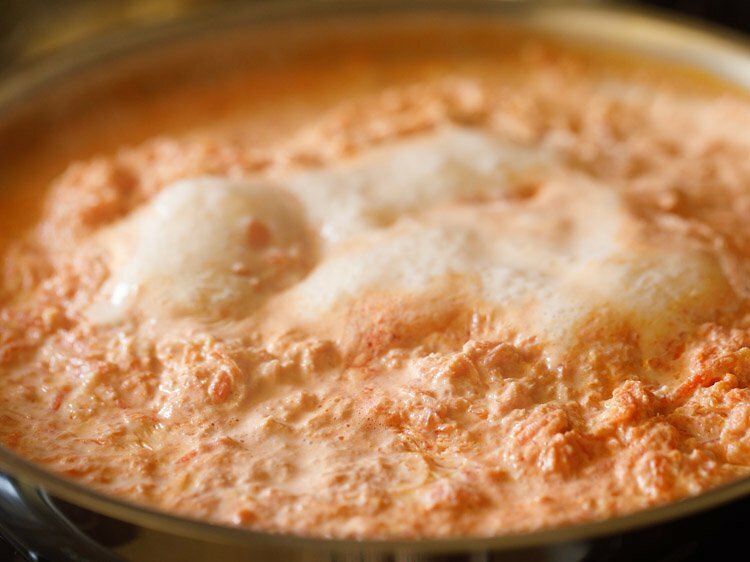 remember to scrape the milk solids stuck at the sides of the kadai or pan and add them to the gajar halwa. some moisture is also fine in the halwa. serve gajar ka halwa hot or warm. 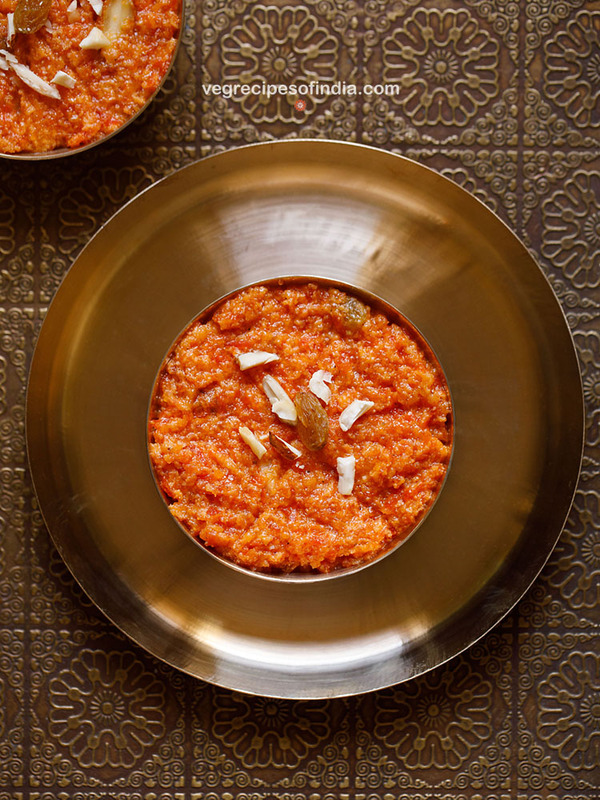 refrigerate the leftovers and while serving you can warm carrot halwa. garnish with some chopped dry fruits while serving.